All qigong practises are health giving as the various forms and routines are designed to work on specific acupoints and key meridians to regulate and balance the flow of the internal energetic system or Qi. 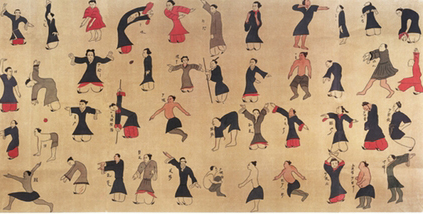 The earliest signs of health-giving exercises was the Dao Yin painting discovered in the Mawangdui Tombs, Hunan Province in 1973. Dating back to 168BC. An early precursor to what ultimately came to be considered as Qigong the practice of Dao Yin involved moving the body in harmony with the breath and mental focus or intent. 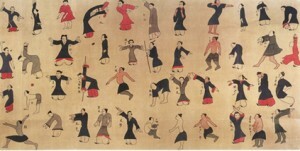 There are reported to be 1,000s of systems of Qigong which can vary greatly in terms of practice. From static, lying, sitting or standing postures where the energy is either allowed to find its own path through the meridians, or else to be directed my mental intent to some of the more physically active and flamboyant routines, many things can be done under the title of Qigong. Originally these systems were taught either in monastaries to monks and nuns, kept in close family groups, to stop it being watered down and dissipated. Today we can see qigong being practised in places as diverse as every park in mainland China any morning to the local community centre or elderly care centre. Qigong is indeed accessible to all ages and physical conditions with an array of styles designed to regulate the energetic system for all manner of ailments. In China they have now created a Health Qigong Association where they have taken a number of key routines such as Yijinjing, Five Animals, Baduanjin and Six Healing Sounds, standardised the way they are taught, practised and ultimately evaluated, in terms of good practice. They are now issuing Duan Gradings and holding Competitions around the world on these, and probably soon to be more, qigong forms. Through these pages we will introduce you to the principles and practice of Qigong and hopefully allow you to find your own way to better health.